The Sunset Harbour South in Miami Beach one of two buildings rising 25 stories just south of the four land masses better known as the Sunset Islands. 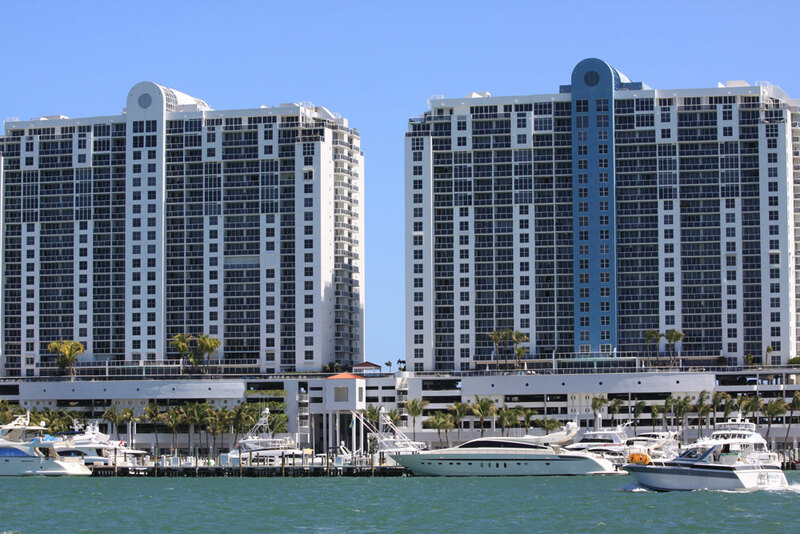 Both buildings are located in a northeastern corner that allows residents of Sunset Harbour South to enjoy views of the Sunset Islands quartet, Biscayne Bay, the six Venetian Islands and the Miami cityscape across the bay to the west. A trio of heated pools, a pair of conference rooms and party rooms, fitness facility, a scenic area where you can walk and admire the bay, the Sunset Harbour South condo offers plenty of amenities. You'll also come across 125 boat slips, perfect for Sunset Harbour residents that are also into sailing. The Miami Beach condos for sale within the building have one, two or three bedrooms. Even if you aren't into sailing, Sunset Harbour South residents can explore the rest of the barrier island of Miami Beach. You'll find the Miami Beach Golf Club, Miami Beach Botanical Garden, the New World Symphony and Lincoln Road all nearby. The Venetian Causeway is one of the quickest ways to visit the city of Miami to the west. Alton Road which is about three blocks to the east of Sunset Harbour South is also full of various places to visit.